My life in Xi’an is ruled by the teacher’s shuttle bus. Don’t get me wrong—I am very very grateful for the shuttle bus without which I could not live in my lovely neighborhood. However, it angers me that I am so dependent on the shuttle bus when there are seemingly other options that could get me where I’m going on time. Actually there are lots of them—yellow and green VW Jettas that make a mockery of the institution of taxicabs, destroying all of my naïve preconceptions and we’ll just throw in my hopes and dreams as well. Let’s start with the naïve preconceptions. As a California suburbanite taxis were truly something seen only in the movies. Taxis—as I understood them—were very responsive to hand signals and whistles. One had to merely stand on a curb and throw up one’s arm or umbrella (1-2-3 Hail! *) and a taxicab would come racing to a halt with all the enthusiasm of a dog returning with its ball. Upon dropping off a fare, taxi drivers were already on the scent of the next, peeling away and weaving back into the flow of traffic. Fast, efficient, eager—that’s a taxi. I rode in a taxi only once in my entire childhood. This solitary time came when our loyal Dodge Caravan, “Big Blue,” broke broke down in San Francisco during a family excursion. After getting our van to a garage, our family of five piled in a cab and continued with our plans for the day. In my memory it hasn’t seemed at all difficult to get a cab. It was as it had been shown to me in movies, you just stood on the curb for a few minutes and—voila! A taxicab! This experience did not prepare me well for Xi’an. It allowed me to hold onto the obviously false belief that taxis serve at the passenger’s need. Though in Hangzhou there were signs of my future trouble. A short visit during Spring Festival introduced me to the disturbing phenomenon of taxis simply refusing to take you where you needed to go. The dismissive wave of the hand, that dreaded horizontal shake of the head. I was dumbfounded. Taxis turning down fares? What did they think they were? Upon arriving in Xi’an I assumed that taxi drivers would be eager for my patronage, especially since I was a guaranteed 60 RMB fare. A creative driver could get that even higher (65! 70 RMB!) by taking me on the “scenic route.”** However, in fact, drivers recoiled from destination as I do from the scent of stinky tofu. I quickly learned that it is far more trouble than it is worth to deviate from the school’s spartan shuttle bus schedule. However, this semester has thrown a hitch into my dutiful riding of the school shuttle by requiring me to miss the afternoon pick-up. I am now tossed into the wild seas of needing a taxi for a long fare at the worst possible time of day—the taxi change-over time. I smugly thought I had a solution to this problem—a private car. Through my work I thought I could arrange someone to pick me up and take me out to my college, thereby dusting my hands of that problem. My colleague though, in her most matter-of-fact text message to date, told me that no one would do that. No one? Did people stop needing money or gainful employment? What’s going on with the world?!? On Monday I allowed myself a generous 2 ½ hours to get out to my college. I told myself it wouldn’t be so bad—think positive! You’ll get a taxi! I paced the street anxiously, checking the time often. Even when I could get an available taxi to talk to me they, of course, didn’t want to go out to my college. After 30 minutes, I decided I couldn’t wait much longer; I needed to make a decision: keep waiting or go catch a bus. I could take a city bus up to where it connected with one of the two subway lines in Xi’an and take the subway to the end of the line at the train station where their was a true taxi stand—dozens of taxis all lined up ready to go (in theory). Not feeling confident enough to risk it, I caught a bus and enjoyed a packed bus ride and packed subway ride. At the train station, I was happy that there was a train disembarking and there was a line at the taxi stand. (If that doesn’t make any sense to you, that’s because you haven’t lived in Xi’an.) I’ll only say that a line of fares provides cover—the taxi pulls up, you get in, and it drives away. There’s much less chance of refusal. However, even here I wasn’t safe. Upon telling the driver where I need to go—a destination only about 10 minutes away—he is extremely peeved, lots of grousing, eyebrows down, scowls abound. And why might he be so vexed? Oh, probably because he wanted a longer fare. And he would have had a longer fare if he would just come down to my neighborhood or had one of his cronies deign to pick me up. Oh, and did I mention that he immediately turned off the meter? Now I’m going to have to pay more because HE’S inconvenienced by my destination. If there’s going to be a contest for more aggrieved person in that car I’ll be DARNED if he’s going to win! In summary: I can’t get a taxi from downtown because it’s too far away; I can’t get one from the train station because it’s too close. I clearly need a taxi pick-up that’s JUST RIGHT. And where, might I ask, would that be, oh tetchy taxi drivers of Xi’an? **Little did they know that I tracked their routes on my phone and got smart to their tricky ways. From August to December of 2013 the author of “Normal” Life suffered a severe case of Terrible Horrible No Good Very Bad Semester which resulted in the cessation of all blogging activities. The origins of this survivable, but extremely demoralizing condition were complex and there were a number of contributing factors. The patient suffering under this terrible horrible condition was fortunately removed from the environment for a period of two months and appeared to recover, but reentry in the original environment may or may not cause a relapse. The impact of certain changes to the professional and social landscape has yet to be determined. Doctors will be monitoring closely. Expect regular updates. It’s unusual for me to want to reblog someone else’s work, but I was just scrolling through my Reader and this post just, you know, hit me where I am. No need for anxious queries. I am not contemplating anything drastic. However, the past semester is making me question where I will be in Xi’an next year, which opens up the mental maelstrom of “what then?” Expat Lingo’s post captures so well this moment of indecision that I thought I’d go ahead and share. There comes a time when all expats must face the music and decide whether to stay or go, and if they go, where to go. This hot mess of a decision is complicated by all sorts of things like employers, families, visas, money and heart-strings. When the decisions get tough, it helps to turn to a power beyond ourselves. For some this might be a heavenly being*. I, however, have settled on Bruce Lee. Empty your mind, be formless, shapeless — like water. Now you put water in a cup, it becomes the cup. You put water into a bottle, it becomes the bottle. You put it in a teapot, it becomes the teapot. Now water can flow or it can crash. 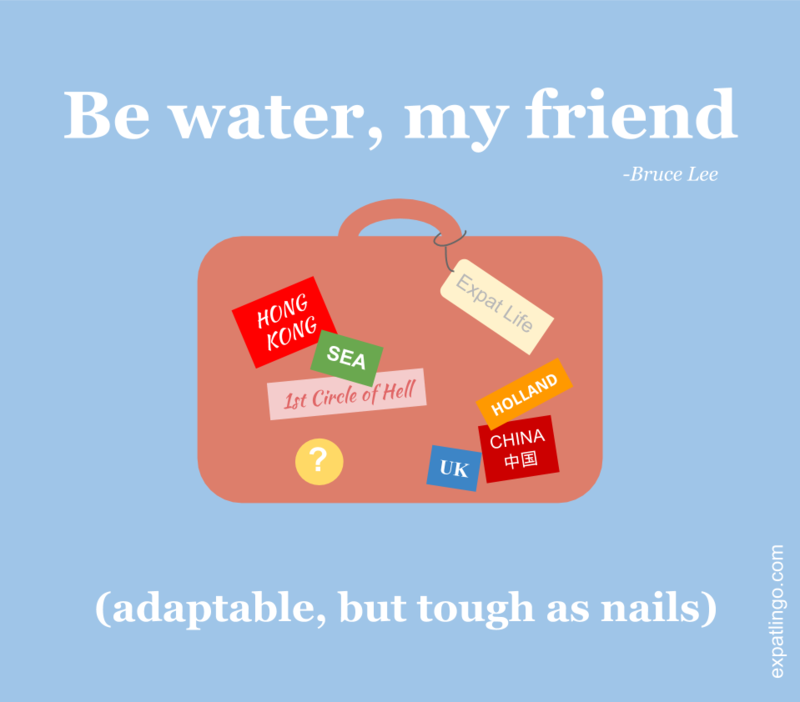 Be water, my friend.